Organic chicken, Water sufficient for processing, Organic pea flour, Organic dried peas, Organic sunflower oil, Tricalcium phosphate, Salt, Agar-agar, Potassium chloride, Choline chloride, Organic chicken broth, Salmon oil (preserved with mixed tocopherols), Calcium carbonate, Zinc proteinate, Iron proteinate, Vitamin E supplement, Thiamine mononitrate, Niacin supplement, Calcium pantothenate, Copper proteinate, Biotin, Vitamin A supplement, Manganese proteinate, Sodium selenite, Riboflavin supplement, Vitamin B12 supplement, Pyridoxine hydrochloride, Calcium iodate, Vitamin D3 supplement, Folic acid. 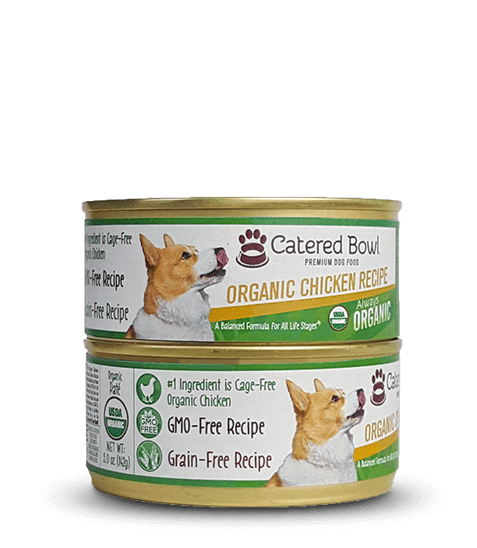 Catered Bowl USDA Organic Chicken Recipe is formulated to meet the nutritional levels established by the AAFCO Dog Food Nutrient Profiles for all stages of life. Except growth of large size dogs, 70 lbs. or more as an adult. For adult dogs, feed 1 1/2 to 3 (12.5 oz) and 3 to 6 cans (5 oz) per day for each 20 pounds of body weight. For pregnant and nursing mothers and for puppies up to 1 year of age, feed up to 2 to 2.5 times as much as for adults or up to 7 cans per day. The amount of food your dog requires will depend on activity, age, environment, breeding status and breed. Feed at room temperature and refrigerate unused portion in a sealed container. Remember to always keep fresh, clean drinking water available for your dog. Puppies less than 6 months old and lactating females require twice the amount of food as an adult dog and should be fed 3 to 4 times a day. Puppies 6 months to a year should be fed twice daily. Senior and overweight dogs may be fed a reduced amount, depending on dog’s weight and activity level. Grain-free diets may not be suitable for all dogs. If you have any dietary concerns, please consult your veterinarian. When changing to Catered Bowl Organic Chicken Recipe Dog Food, some dogs may do better by making a gradual transition over 10 days. Start with 25% of the new food mixed with 75% of the previous diet, and gradually increase the new while decreasing the previous until the transition is complete.